The troopers turned to salute and shouted “Cobra!” They ran towards the hangar with Cobra Commander following them. Cobra Commander snatched the weapon from Destro’s hand and hurried away to the helicopter hangar, while his two bald-headed minions looked at each other in disappointment. The Tyrannos stomped their way across the canyon, shoulders slumped and breathing deep. 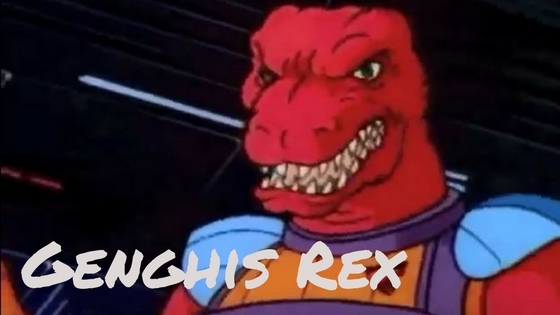 Genghis Rex lead the way, mumbling under his breath about his latest defeat to the Dinosaucers. “Uh, Bossasaur?” Ankylo muttered from behind him. “What did you say, Duck-breath?” Genghis said, taking a step towards Quackpot and shaking his big red fists. “Nothing, Chiefasaurus!” Quackpot jumped back, smacking Plesio’s lowered head with his own. “But Bossasaur, look up there!” Ankylo shouted, his finger raised up into the air. Genghis turned to look into the sky and saw six small flying vessels approach. “Dinosaucers?” It didn’t seem likely as they’d never chased the Tyrannos away after they’d actually defeated them, preferring to stand around and laugh as Genghis and his goons slunk away. This latest rout was particularly humiliating, as Genghis--. He shook his head. Next time will be different. “They’re coming right for us!” Plesio said just as the five winged vehicles opened fire. Red laser fire filled the air as each vehicle made a pass at the grouped Tyrannos. Ankylo and Quackpot both fled into a crevasse inside the canyon wall while Plesio jumped into the river below. “Cowards!” Genghis roared, the shoots whizzing by him. He charged across the field, dodging fire, towards his personal ship. He jumped inside and fired off the rockets, launching into the air to pursue his attackers. “You fools think a handful of hang-gliders can destroy a Reptilon ship?” In short work, Genghis had blasted all five gliders out of the sky, each pilot parachuting safely to the ground. He turned his attention to the final flier, a small helicopter firing a barrage of missiles at him. Genghis’s rocket-powered ship easily evaded the primitive weaponry and he flew close enough to the helicopter for his ship’s articulated claws to grab ahold of it. With a powerful hydraulic yank, the helicopter split in two, spilling its pilot into the air before another parachute was deployed. On the ground, the first five pilots were firing their rifles at Genghis’s ship with the same underwhelming accuracy. Ankylo and Quackpot, coming out of their hiding spots, drew their attention away from Genghis, allowing him to land his ship and wait for the final flier to reach the surface. Genghis scoffed, withdrew his Fossilizer pistol and fired at the parachuter, scoring a direct hit. The pilot turned to stone, adding hundreds of pounds to the parachute and causing it to fail. The now statue plummeted to the earth and shattered into a pile of rubble. Click here for Cobra Commander's respect post. Click here for Genghis Rex's. Let's be honest here - did anyone expect Cobra Commander to win? Even with a number of his troops tagging along with him, he was hopelessly outgunned. Cobra Commander himself is a liability, jumping right into battle without a plan, relying only on his over-inflated ego to win, which has never worked for him. Genghis might be stupid, but she's shown to be a decent shot and okay in a fight. He's got way more powerful weapons and vehicles as well. I think that even if Cobra Commander had brought on the full might of his entire terrorist organization, he'd still have lost to the technologically superior and more ruthless Tyrannos. 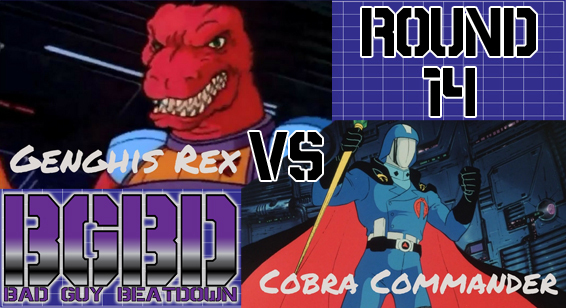 To see the winner of the last round - Hordak vs. Hun-Dred, click here. And to see the rest of the Bad Guy Beatdown matches, click here.